Free School in Round Pen:Meet Tabitha. Tabitha is 25 years old and in need of a new place to call home. This is the information her owner has sent about her. "This pretty girl is very much in need of a loving home! Tabitha is so sweet and easy! 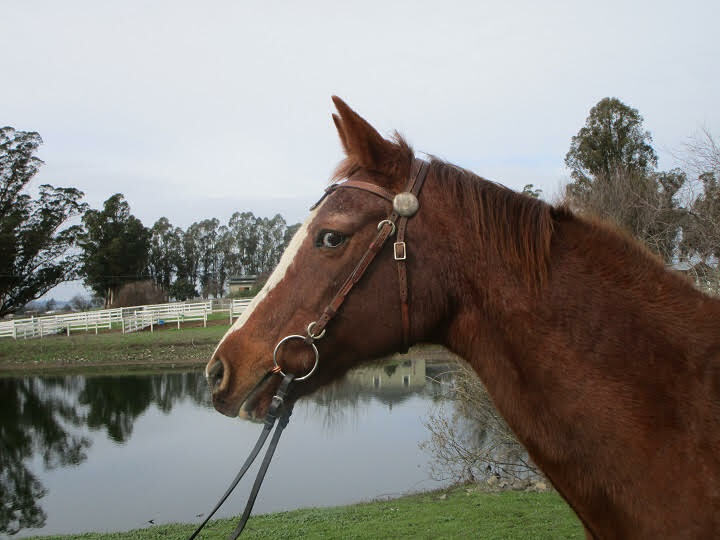 Who out there would thrive on giving Tender Loving Care to this delightful mare! Being around Tabitha is like being around a female Buddha. Tabitha would thrive in your backyard barn. She is quite content relaxing in a stall/paddock. No turn out or pasture required. The less stimulation, the happier she is. She has had a difficult life, and would like to live out her twilight years in peace and tranquility. Tabitha was returned to CPHS from previous home with new and worse injuries. Needs to be rested and doctored. However she is currently plump and sleek. Loves to be groomed and petted and adored. Will be a super safe and pleasant light riding/leadline horse once she has recovered from her injuries. "Tabitha": Smart, steady, and safe, safe, safe! 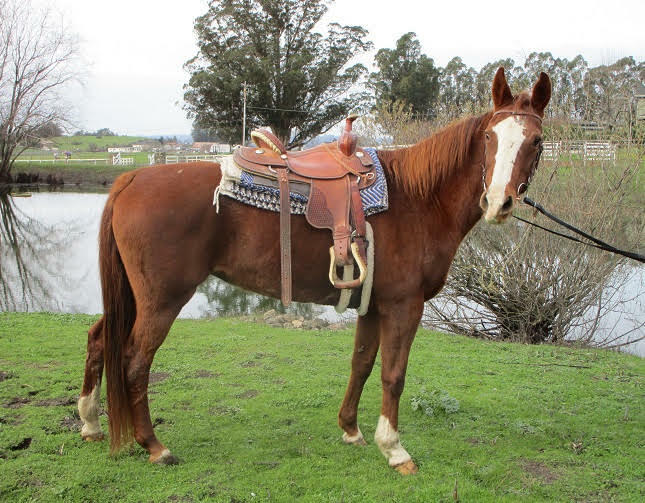 This mare is worth her weight in gold! Proudly in full training with Clare and Clarity Performance Horse Sales. Only at the barn for a day, and look how quiet and sweet she is! Lovely on the ground, polite and easy. Walks right in and out of the trailer, travels willingly. Adjusts quickly and easily to new environments. "Been There, Done That" attitude. Not lazy, just a bit of fun "pep and go" energy. 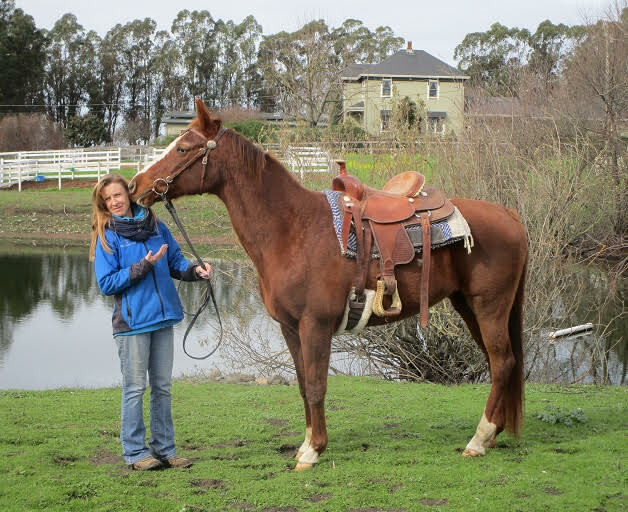 Tabitha was last used on a Trail String/Guided Trail rides, so she is very good on trails with beginners and inexperienced riders. 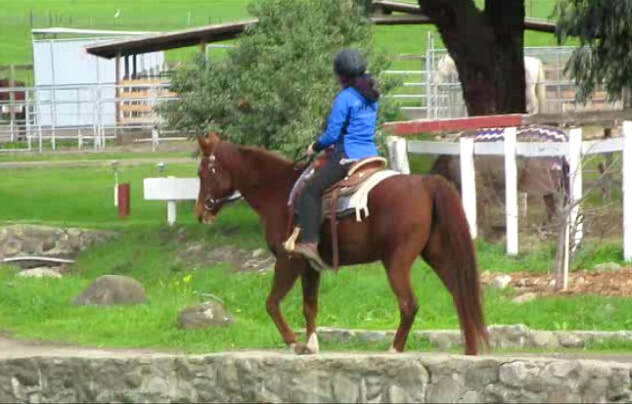 If you are looking for a light riding, Trail, Companion, Children's Leadline, and/or Therapy horse, here she is! Smart, steady, and safe, safe, safe. Sound, with just a bit of a "hitch in her get along" in the trot. Needs weight, conditioning and shine, to bring her to her full potential. Click the links below for video. Tabitha is located near Petaluma, CA. Please contact AAE if you are interested in Tabitha.